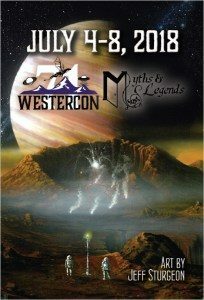 I’ve been invited to give a science-track presentation at this year’s Westercon (Denver, July 4-8). They asked for a topic, so I proposed The Science of T-Space (blurbed as “Terraforming and warp drives and fusion power, oh my! What’s the real science behind Alastair Mayer’s T-Space series?”), which they accepted. This gives me a chance to talk about some of the stuff I didn’t want to just info-dump in the stories (grin). The current schedule has me on at 4pm on Thursday, July 5. I realize that won’t work out (either time or location) for some of you, but if you can make it, I’d love to see you there. My plan is to cover some of the key topics and then throw it open to questions. Speaking of, if you have questions about the background of T-Space, go ahead and post them below. I’ll answer them here, and also see about working it into my presentation. I’ll be around at Westercon for the whole very long weekend. Currently I’m not planning on having a sales table. StarFest worked out alright but I’d rather attend the events. If you’re going to be there, check out the schedule, I may be on other panels.